Skylark Bed and Breakfast. Ardmair, Ullapool, in the Highlands of Scotland. Opened in 2013, spacious comfortable accommodation. Overlooking Ardmair Bay and Beach, set in beautiful environment. Breathtaking views out to sea and the Summer Islands. Skylark is a newly built bed and breakfast provider at Ardmair, 2 miles north of Ullapool in the north west Highlands of Scotland. Skylark has been designed and built to offer high quality welcoming accommodation to visitors wishing to visit this wonderful part of Scotland. Our location is perfect if you are touring the Highlands, looking for a base to explore the region, or working locally and wanting somewhere comfortable and convenient. With spectacular views over Ardmair Bay and out to the Summer Isles, Skylark offers one of the most breathtaking seaviews in the highlands. Please take a look around our site for further information about Skylark, Ardmair and Ullapool and how we can offer you a great place to stay for your holiday in the Highlands. Contact us if we can help or advise you in any way. 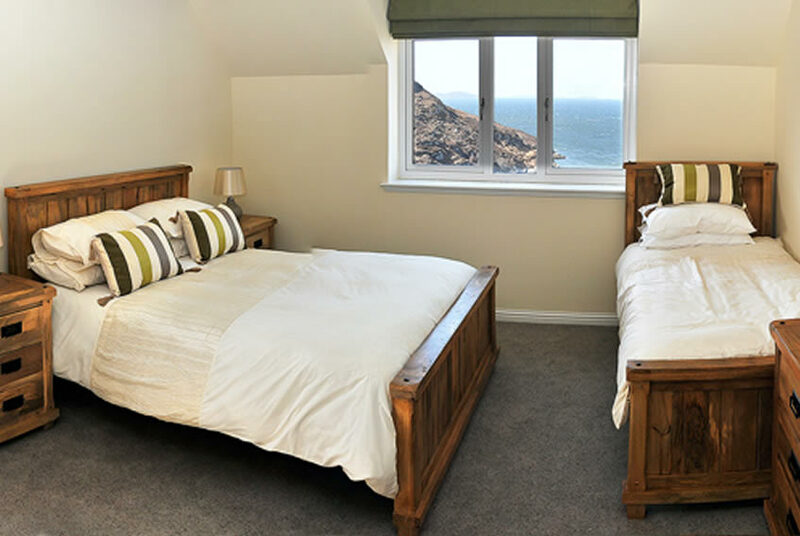 Large, spacious room featuring a Super-King sized bed with stunning views of Ardmair Bay, Isle Martin the Summer Isles as well as "Ben Mor Coigach" mountain. 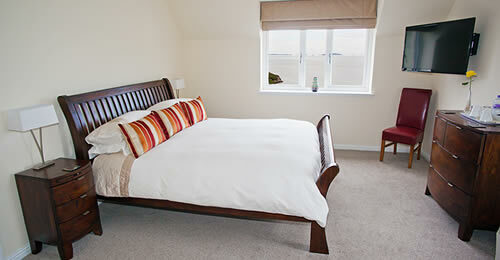 Super-King sized bed, ensuite shower room, 42" LCD Smart TV, Sky TV including Sky Sports, Wi-Fi broadband. Large, spacious room which can easily accommodate up to a family of 4 if needed, with stunning views of Ardmair Bay, Isle Martin the Summer Isles as well as "An Teallach" mountain. 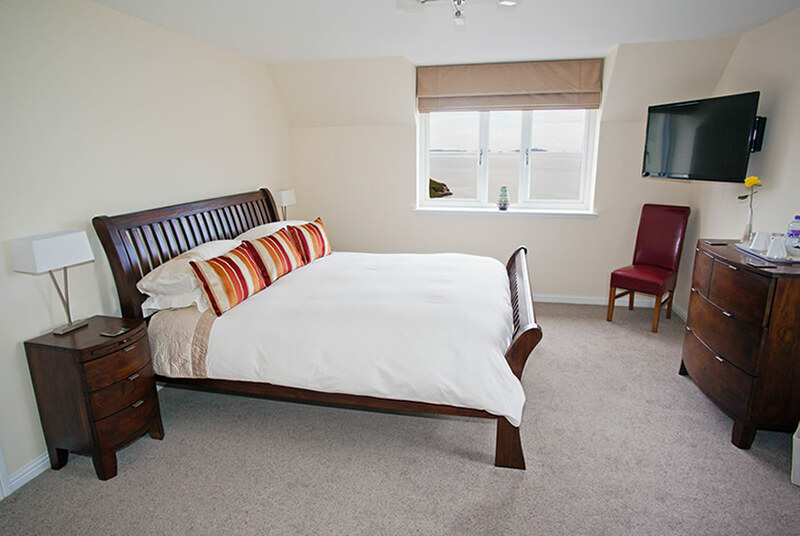 King sized bed and single bed, ensuite shower room, 42" LCD Smart TV, Sky TV including Sky Sports, Wi-Fi broadband. Skylark was opened in 2013. 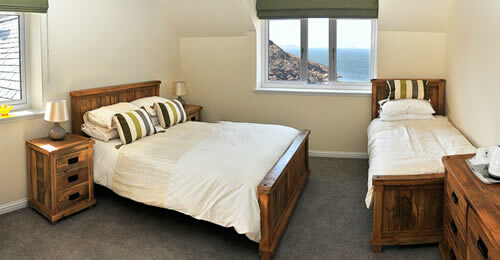 Built to offer high standard bed and breakfast to visitors to Ullapool and the Highlands of Scotland. Overlooking Ardmair beach, Isle Martin and the Summer Isles, Skylark offers a relaxing environment with beautiful views. Full breakfast included and packed lunch available. We offer a generous breakfast and can arrange packed lunch if required. Off road parking. Private access. Garden. Sorry, no pets. We only offer two rooms but both are designed to the highest standard and intended to make your stay with us comfortable and enjoyable. LCD Smart televisions: offering internet access and SKY sports. Wi-Fi internet, allowing guests to stay in touch with home and work. Large en suite shower rooms. MacraeMedia Website © 2017 Skylark Bed and Breakfast. All Rights Reserved.